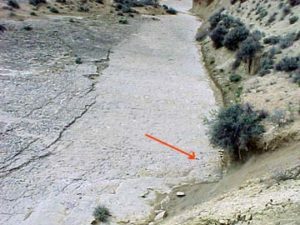 Located just west of Shell, Wyoming, along the Red Gulch/Alkali Scenic Byway, is Wyoming’s Middle-Jurassic Treasurer: One of the largest collections of dinosaur tracks in North America. Members of our GeoScience team discovered these rare tracks, which are situated over hundreds of acres of public, private, and state land. There are three main areas, listed below. Click on each name to go to its section on this page and read more about it. Dr. Erik P. Kvale, a research geologist with Indiana Geological Survey and Director of the Iowa State University Geology Field Station in Shell, Wyoming, discovered the Red Gulch Dinosaur Tracksite in May 1997 while exploring the Bighorn Basin with Cliff and Row Manuel, Fran Paton, and fellow geologist Dr. Al Archer. The tracksite contains thousands of rare Middle Jurassic age dinosaur tracks embedded in oolitic limestone. Located on public land near Shell, Wyoming, this site covers 40 acres set-aside by the US Bureau of Land Management (BLM). While standing at part of the tracksite, Cliff asked Erik if they should be looking for tracks. Erik replied, “No, this is the wrong formation — but there is one right at our feet,” pointing at a track located beside them. Erik knew that dinosaur remains in the Middle Jurassic Sundance Formation are a rarity in North America, and there are only a few known tracks. Instead, in the Sundance, one commonly finds fossil shells left from an ancient sea. Yet these dinosaur tracks were clearly made just at the shoreline, not in deep ocean water. The tracks were laid down approximately 167 million years ago. The discovery was significant in that the tracks should not be there, according to prevailing geological wisdom. This area, and most of Wyoming, was believed to be under water during that timeframe — covered by the ancient Sundance Sea. Recognizing the significance of the find, the group notified the Worland office of the Bureau of Land Management (BLM), who organized a multi-disciplinary team of scientists and researchers to research and document the site. Dr. Kvale was one of the scientists selected to conduct the geological research, along with Dr. Michael Brett-Surman, Museum Specialist, Smithsonian Institution, National Museum of Natural History, and Dr. Gary Johnson, Professor of Geology, Dartmouth College. The tracks are preserved in limestone in an area that was once a beach that fringed the Sundance Sea, a vast inland body of water. The individual footprints are aligned in dozens of trackways that can be traced for lengths of up to 12 meters across the bedrock surface. The tracks have been dated at 167 million years old and most range in length from 2 inches (4cm) to 10 inches (25 cm). The largest of these dinosaurs would probably have stood less than 7 feet (2.3 m) in height. Scientists do not know which dinosaur species made the tracks, since dinosaur fossils from this timeframe are so rare. Research continues in an effort to understand more about these fascinating trace fossils. The bedrock surfaces upon which the dinosaurs walked are also covered with wind-generated ripple marks. 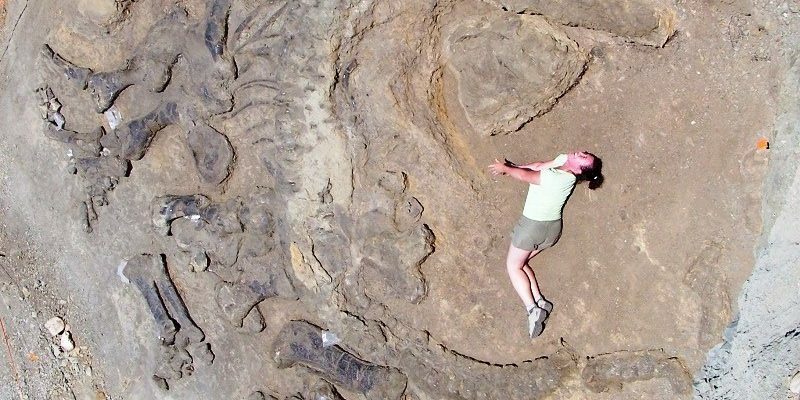 Comparison of the orientation of the fossil ripple marks and the directions of the trackways suggest that the dinosaurs were walking into the wind. Meat-eating dinosaurs probably made these trackways; thus, their upwind travel suggests that they might have been hunting. Many of the trackways are sub-parallel indicating that the group was walking as a pack. The Flitner Ranch Dinosaur Tracksite (FRDT) is located on private land, near the Red Gulch Dinosaur Tracksite.The owners of this property are supporters of the GeoScience Adventures scientific team and allow our geoscientists to conduct controlled excavations and research of the site. Their generous support of the scientific research of the Red Gulch Dinosaur Tracksite and the Flitner Ranch Dinosaur Tracksite areas contributed directly to the comprehensive study of these areas. The tracks were formed 167 million years ago during the middle of the Jurassic Period when dinosaurs reigned supreme. The Bighorn Basin Geoscience Center manages access to this private site. Discovery of these dinosaur tracks on private property was significant since our scientific team could perform controlled excavations (prohibited at the Red Gulch Dinosaur Tracksite), uncovering dinosaur tracks that have not been impacted by years of weathering from exposure to the elements. 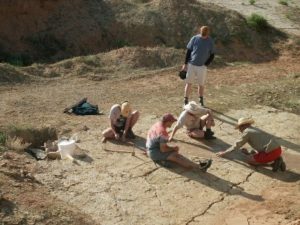 Thus far, 21 trackways and 15 additional isolated footprints of three-toed dinosaurs have been identified in the Flitner Ranch Dinosaur Tracksite area. The footprints are preserved as impressions into the rock. Interestingly these animals seem to have walked on their toes as heel impressions are lacking. The middle toe of most of the dinosaur prints is slightly sinuous. 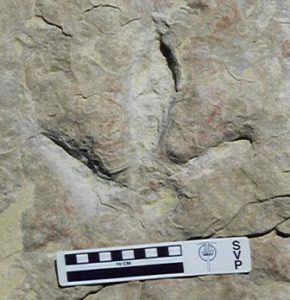 This and other print characteristics — the length of the footprint being greater than the width and rare claw marks that appear at the ends of long, tapering, slender toes — identify these tracks as probable theropod (meat-eating) dinosaurs. 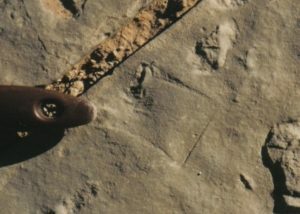 Most of the footprints associated with trackways fall in a single line under the midline of the body and reflect a two-legged animal that walked very erect with one foot placed in front of the other. Many of the trackways are oriented to the southwest. The near parallel pathways suggest that several of the FRDT dinosaurs may have congregated and moved in small groups. Other features that are present on the FRDT surface include cubic salt crystal casts and ripples. The salt crystal casts indicate areas where salt crystals formed from evaporation. These were subsequently dissolved; however, the cubic form remains. The salt crystal casts indicate that the ancient climate was very arid, at least seasonally, when the dinosaurs lived here. The climate may have been similar to that found today in the Persian Gulf. The ripples and the limestone composition of the rock, which preserved the tracks, indicates that the area was a beach or tidal flat and part of the coastline of a vast inland sea; the Sundance Sea that covered a major portion of western Wyoming 167 million years ago. 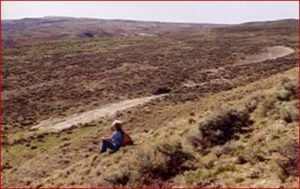 Rowena Manuel, one of the founding members of GeoScience Adventures, discovered the Yellow Brick Road Dinosaur Tracksite on state land while exploring the Bighorn Basin with her husband, Cliff, and her nephew, Dr. Erik Kvale. As Row was hiking down the dry wash, she discovered exposures of three-toed dinosaur tracks in the limestone outcrop. The further she walked, the more tracks she saw. This led her to remark to herself “What will I tell my companions – I walked down the Yellow Brick Road!” And, the name stuck! Like the Red Gulch Dinosaur Tracksite, this meandering dry wash contains hundreds of rare Middle Jurassic age dinosaur tracks embedded in limestone. The dinosaur tracks exposed here are similar to those in the Red Gulch Dinosaur Tracksite. Our GeoScience Team has determined the age of these tracks to be the same as those at the Red Gulch Dinosaur Tracksite – 167 million years.